Humble materials of the earth. When these elements are combined with water, they give birth to a new construction material – the adobe bricks. Adobe construction, like rammed earth construction, is a sustainable ancient building technique that harks back to circa 2000BC or earlier when the word ‘adobe’ was used by the ancient Egyptians to describe sun-dried ‘mud bricks’. Today the word Adobe is synonymous with the architectural style designs common in New Mexico, North Africa and other hot climates. 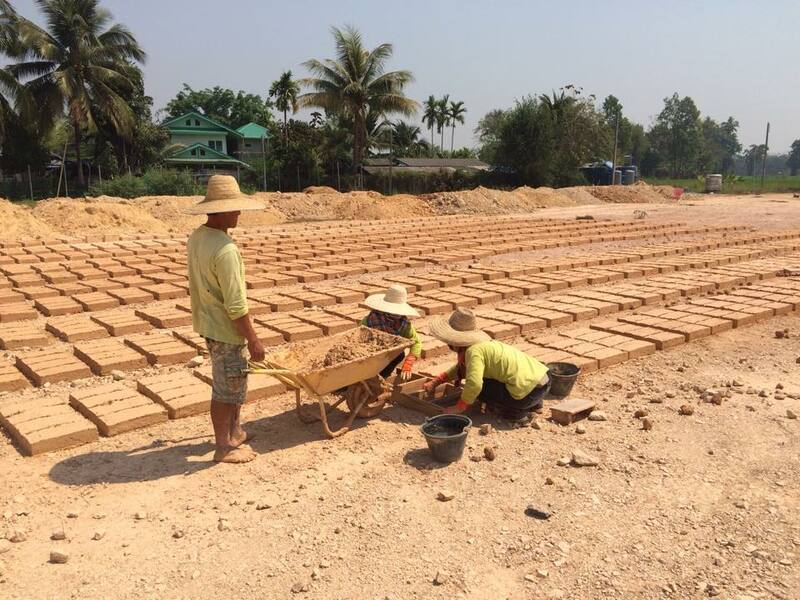 At Chiangmai Life Construction, we continue in this tradition of earth architecture . 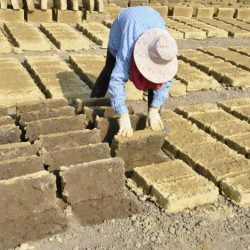 We manually craft these adobe bricks, block by block, into free-form walls with great thermal insulating capability. 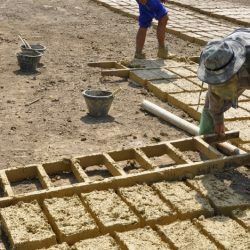 We can also integrate adobe bricks with other natural materials like bamboo to construct durable structures with a low carbon footprint. The different textures (finished or unfinished, rough, combed, smoothed and so on), earthy colour and flexibility of this brick can transform an ordinary space into a special building of beauty that can stand the test of time. Building with adobe is much easier and faster than with rammed earth. Adobe bricks are stacked like normal bricks and do not need formwork. 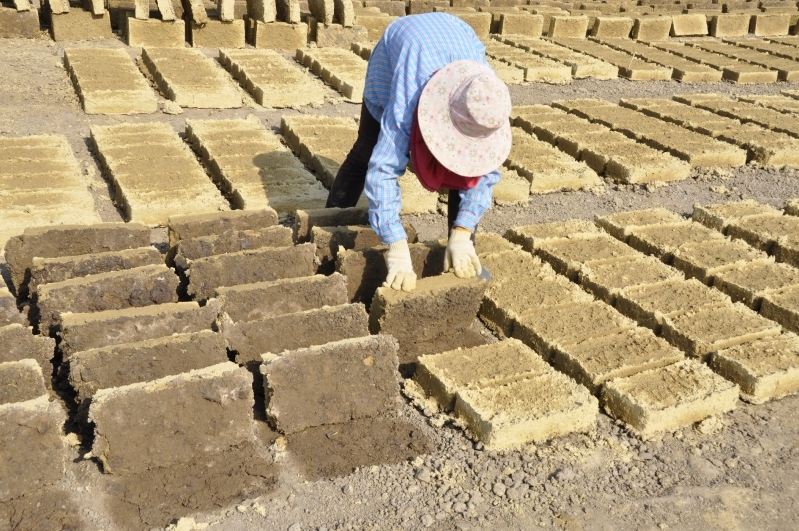 The production of the adobe brick is, however, relatively laborious. In most traditions, clay and sand are mixed with a binding fibre such as straw to produce the brick. 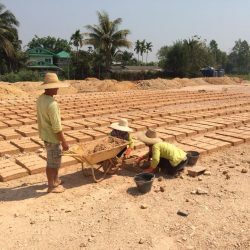 Here at Chiangmai Life Construction, we recycle rice husks which are readily available in Chiang Mai to reduce the carbon footprint. Water is added to the clay and left to set for one day to become homogeneous. Rice husks are then blended in to bind the mixture and to prevent shrinkage and cracking. This final concoction is poured into a frame to form a brick shape. It need not always be a standard brick shape if you prefer another. 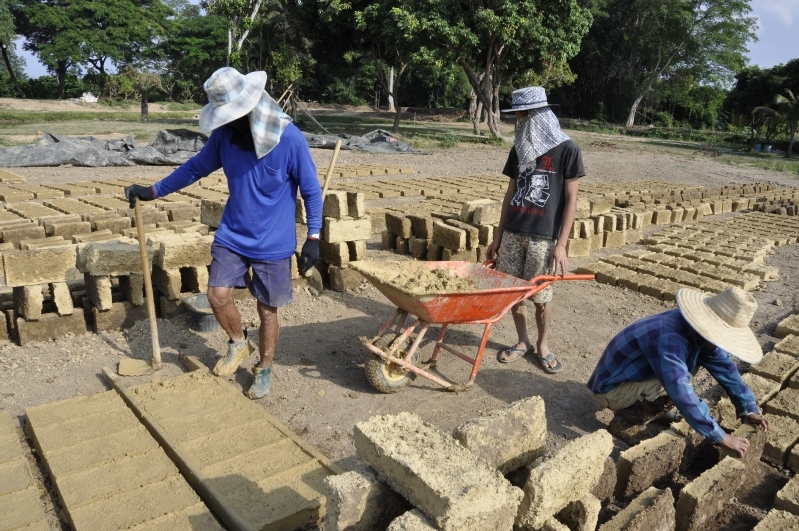 Once the shape is cast, the frame is removed and the bricks are left to dry in the sun. 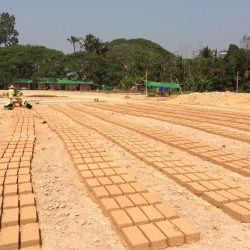 Sundrying is usually sufficient & there is no need for additional pressure equipment .When its edges turn white, the brick is turned on its sides to allow all its surfaces to dry evenly. 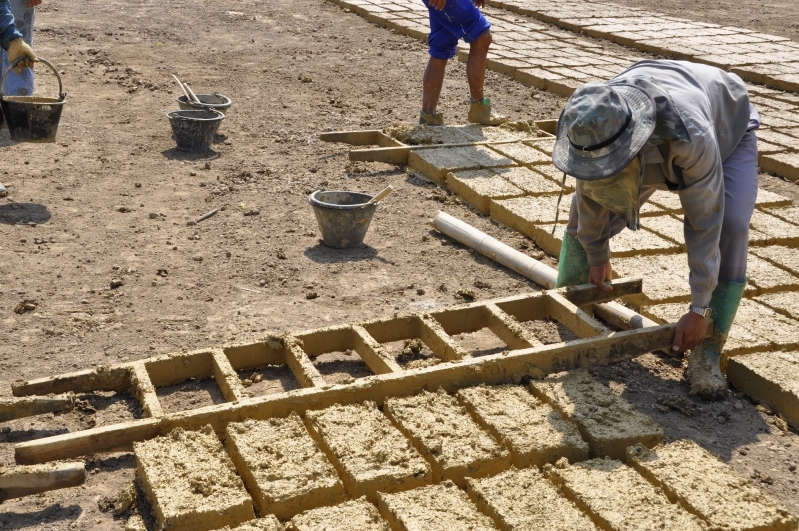 The drying process should be long & slow so the individual bricks can dry without cracking. 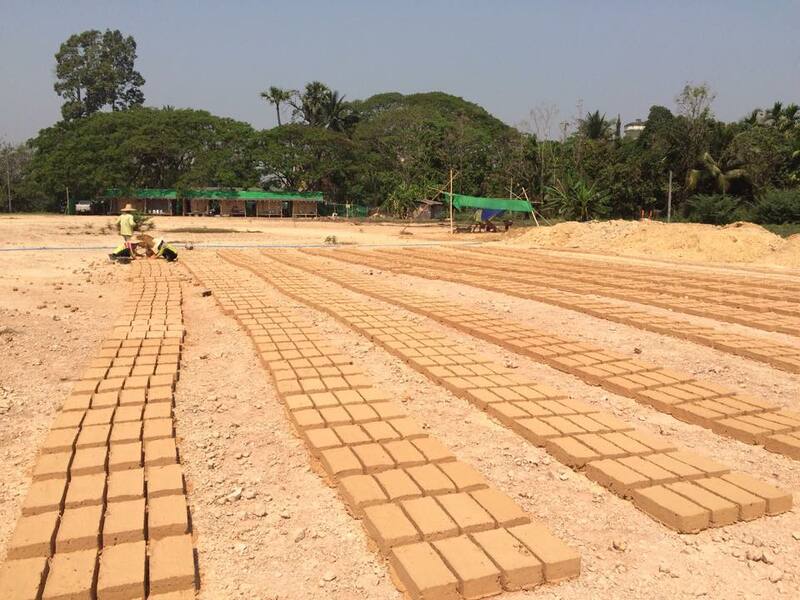 The brick should be well dried out and ready for use after 2 – 3 weeks. 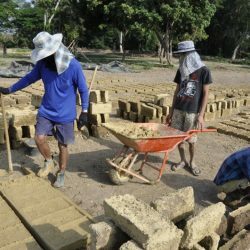 Construction using Adobe Bricks is sustainable and has a low carbon footprint as it does not abuse natural resources. Adobe walls are also good sound insulators. Step into a room made of adobe bricks and you will feel a soothing quietness and calm that blankets you from loud noises outside. Their thermal mass stores heat during the day, thus keeping the room cool. Throughout the evening and night, they slowly release the heat. With adequate protection for exposed areas and simple maintenance, adobe structures can last a long time. One good example is the historic Lopez Adobe in San Fernando, California. It was built in the late 1800s, survived 2 earthquakes and is still being used today as a museum.